2 Calif. I saw quite a bit of Hollywood and met a number of movie stars. 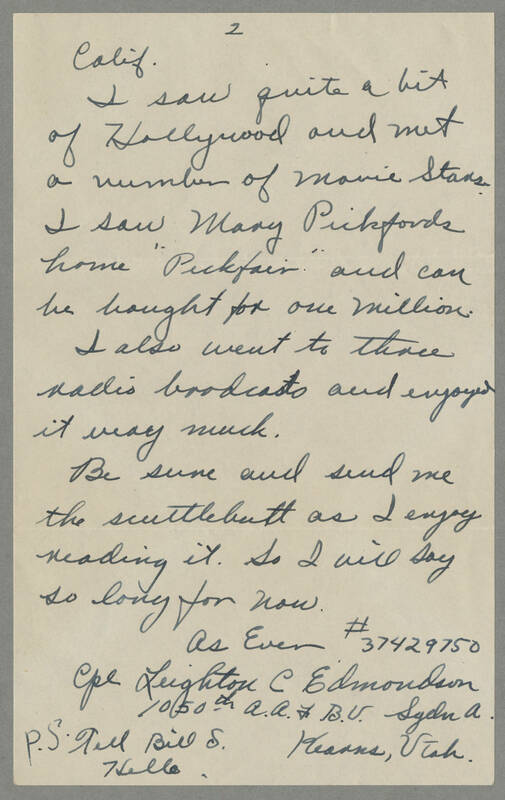 I saw Mary Pickfords home "Pickfair" and can be bought for one million. I also went to three radio brodcasts and enjoyed it very much. Be sure and send me the scuttlebutt as I enjoy reading it. So I will say so long for now. As Ever Cpl Leighton C Edmondson 37429750 1050th A.A.F.B.U. Sgdn A Kearns, Utah. P.S. Tell Bill S. Hello.